The move, which would guarantee the Vikings a second-round pick if Nick Easton left for another team, would pay the 26-year-old almost $3 million in 2018. While the Vikings wait to see if they’ll have a change at one of their starting guard spots, they made a move toward bringing the other one back on Monday. According to a league source, the Vikings are expected to place a second-round tender on left guard Nick Easton, who is set to become a restricted free agent on Wednesday. The tender, which would guarantee the Vikings a second-round pick if Easton left for another team, would pay the 26-year-old $2.914 million in 2018. 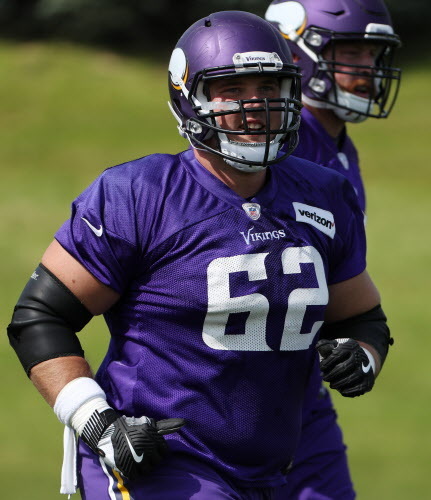 Easton, a former undrafted free agent the Vikings acquired in trade with the 49ers during the 2015 season, started 12 games at left guard before fracturing his ankle last season. His return comes as the Vikings try to figure out what they’ll do at their right guard spot; the team has interest in bringing back Joe Berger, according to NFL sources, but the 35-year-old could get a chance to explore potential fits elsewhere as the Vikings try to sort out the ramifications of a possible Kirk Cousins contract on their final financial picture. The team has decided not to place a RFA tender on lineman Jeremiah Sirles, and could consider playing Mike Remmers at guard, where he finished the 2017 season. According to a league sources, safety Anthony Harris and running back Mack Brown signed their exclusive rights free agent tenders on Monday.